This past week has provided no shortage of blog fodder. But with Holy Week approaching I find myself aspiring to dwell on things more timeless than Hobby Lobby and more compelling than World Vision's wish-washy decision making. This season I think more than any other begs both believer and skeptic to contemplate the sometimes vague and often elusive meaning behind the notion of following Jesus Christ. Our tendency is to be biased against dated material, assuming it has little to offer us centuries later. But there are some very old stories worthy of retelling for the perspective they lend in this regard. The following is one I encountered recently and have adapted from the record of an ancient historian named Eusebius*: As the early church struggled to come into its own Christians found themselves largely misunderstood by the wider world around them, that is the Roman Empire. I know that must be hard to believe given how clearly understood Christians are in the 21st century. Nowadays when the opportunity presents itself Christians are always so articulate and well reasoned in defending their faith. But I digress and I haven't even introduced the main character yet. In Rome Christians were assumed to be atheists based upon both their refusal to pay homage to any of the myriad of Roman gods and their refusal to pay tribute to Caesar. It was the latter that led to the demise of the Bishop of Smyrna in the year 156. 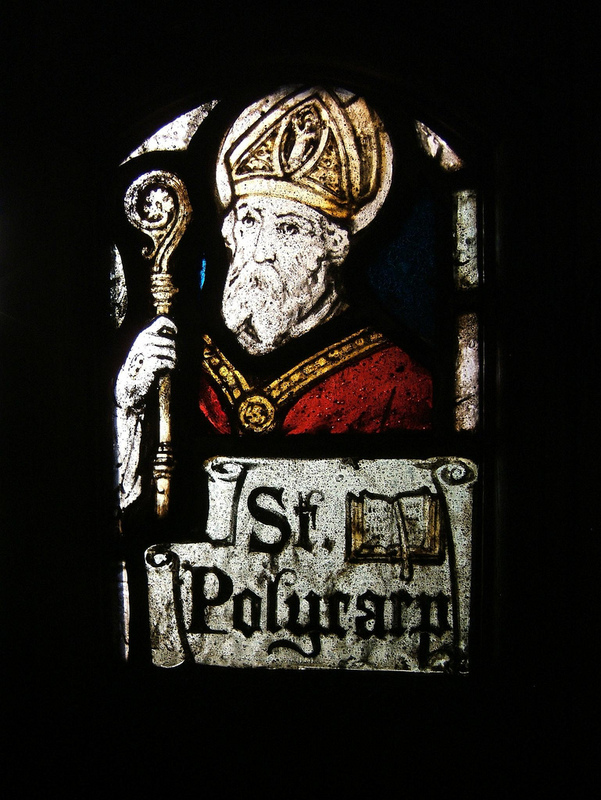 His name was Polycarp. The Romans of the day had turned religious persecution into an entertainment venture, herding Christians in particular though not exclusively into stadiums for the purpose of testing whether or not they would acknowledge Roman supremacy or adhere to their faith when faced with the imminent specter of death. Not just any death mind you, but torture the likes of which seems unimaginably horrible. More fortunate captives were simply burned alive or mauled by wild animals. Others not so lucky suffered by more creative means. Some were strapped to a rack designed to incrementally tear them limb from limb while others were tied to an iron chair which was gradually moved closer to flames until they were literally roasted alive. Given the citizenry's fondness of such vile sport, and given Polycarp's comparatively high profile in Smyrna it was only a matter of time before his number was up. Crowds began chanting his name and the officials sought to give them what they desired. Polycarp, an old man well into his 80's, barely ran from his inevitable fate though friends shuffled him from one house to another attempting to conceal his whereabouts. But the Romans knew how to use torture for their benefit and eventually compelled one unfortunate chap to give up Polycarp's location. When they finally pounded on the door of the place where Polycarp was staying he simply said, "God's will be done," and went downstairs to warmly, yes, warmly greet those who would take him captive. In fact he invited them in for dinner, a bargain he agreed to keep so long as he be allowed to return upstairs and pray for one last hour. After that hour had passed and presumably everyone had been fed it was off to the coliseum. During the carriage ride there were apparently several individuals riding along who attempted to persuade Polycarp to simply acknowledge Caesar as Lord, pay the required tribute, and consequently be spared the agony he was about to endure. Polycarp of course refused this course of action. Those trying to persuade him otherwise were so frustrated upon reaching their destination that they pushed the old man out of the carriage so forcefully that he fell and skinned up his shins. Nonetheless the unfazed Polycarp stood up and was promptly marched into the stadium. Amid the roar of the crowd the proconsul confirmed Polycarp's identity and then urged him, "Recant and say, 'Away with the atheists!'" What he meant of course was away with the Christians. In a stunning display of defiance Polycarp turned, gestured dramatically toward the jeering crowd, and indeed called out, "Away with the atheists!" Polycarp was quite articulate in that moment and as a result the authorities were infuriated. But he wasn't finished. "If you suppose that I could do this," he told the governor, "pretending not to know who I am, listen carefully. I am a Christian. And if you wish to learn the teachings of Christianity, choose a day and you will hear them." The governor was in no mood for an education. He sentenced Polycarp to be burned alive immediately, to the delight of the cheering masses. Polycarp requested of his executioners that they not nail him fast to the grid, saying that his faith would enable him to remain in the flames. Surprisingly they complied with his request and then lit the pyre. Whether the stuff of legend or actual fact the account goes that Polycarp would not in fact be burned by fire. Rather the flames simply danced around him but were unable to penetrate his body. In any case the actual cause of death was ultimately not fire but a lance thrust through Polycarp's body. History such as this serves to warn against an error those of us ensconced in suburbia often make. It is a mistake to think that following Christ is the way to an easier, more comfortable life. It's much worse than that...and much better. Following Christ is a paradox that calls individuals to indeed find their lives, but only after losing them. We don't face the flames and claws of Roman persecution. Thank God, because how many of us would really be able to take it? We whine about a million things much less devastating, like when we feel our personal rights and freedoms are being stripped away. But no one, not even Polycarp, knows more about being completely stripped of his rights than Jesus Christ. Yet out of love for the Father and by extension love for us he willingly gave them all away, even giving away his life so that through him we might be able to find ours. *Eusebius: The Church History. Tran. by Paul L. Maier (Grand Rapids: Kregel, 2007).